Just A Car Geek reader, Matthew, just sent me this Craigslist link. The Matra-Simca Bagheera was the forerunner to the Matra Murena. (You can find my January post about the Murena here.) It featured a Simca 1.3 liter engine. Like the Murena, the Bagheera was made of fiberglass and was a 3 seater (no backseat, there are 3 separate front bucket seats.). Despite having a small engine, the Bagheera was relatively quick. 60 MPH came in 12 seconds and the top speed was over 110 MPH. There are two cars being offered as a lot on Craigslist. 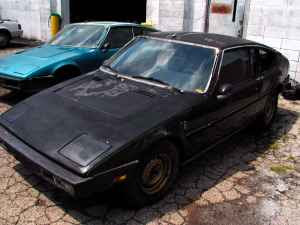 It sounds like both cars are, for the most part, complete but in need of total restoration. According to the seller, the cars come with extra body parts, including "molds to make bumpers". Interesting. The asking price of $950.00 for the whole lot seems like a spectacular bargain. A big "thanks" to Matthew for bringing this to my attention! !